Illustration courtesy of Motorola Solutions, Inc. It is not possible to overstate the importance of hearing protection for sportsmen. 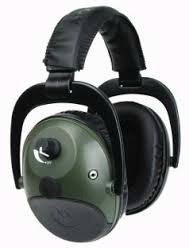 As shooters, we are dealing with noise above 140 dB, well beyond the range where hearing protection is recommended (85dB). What is amazing to us is the number of folks who do not wear ear plugs or ear muffs when shooting, despite the knowledge that the sound can cause permanent hearing damage. A physician explained that damage to the cilia in the ear is gradual and cumulative. Once the cilia and their nerve connections are damaged, there is no turning back. As we age normally, any damage that occurred early in life, becomes exacerbated and amplified. Hence, if you attended a lot of rock concerts as a young individual (without hearing protection), or were exposed to gunfire on the range or in combat, the damage inflicted then becomes progressively worse with time. Chuck Hawks, in his article Hearing Protection, does an excellent job of discussing the benefits of hearing protection and how noise affects your ears. Standard ear plugs are inexpensive and a must for all shooters. However, if they are not fit properly into the ear canal, their theoretical noise reduction of 25 dB to 32 dB drops drastically, even to the point of providing nominal protection. The fact of the matter is that most folks have no idea as to whether their ear plugs are fitted properly. If the sounds are somewhat muffled, they assume they are good. Not so, which is why we recommend the use of earmuffs on the shooting range at all times. Whether you pay $25 or $300 for your earmuffs, we also recommend ear plugs inside when folks are shooting magnum firearms or you are next to someone with a muzzle brake. We have spent the past three months testing the Motorola Talkabout MHP81 Earmuffs in the field and on the range. One of the first things we noticed was that they are comfortable to wear. Weighing only 10.9 ounces, you quickly become unaware that you are wearing them. The low profile ear cup with its padded over-molding does not get in the way when shooting or wearing glasses. Unlike a lot of earmuffs, wearing glasses with these does not break the seal over your ears. The MHP81 were obviously designed with shooters in mind, as most ranges require shooting glasses when on the firing line. "Suppresses Impulse Sounds and offers protection against impulse noise like gun shots through compression. Loud impulse noise like gun shots will be compressed above 85 dB (+/-3dB) with a very fast attack time. Through compression technology you will never lose situational awareness, as your system does not shut off above a certain sound level. This is less discomforting for your mind/brain, as the system does not shut off and on." The dual speakers have independent volume controls on each muff. This enables one to independently adjust the volume for each ear (up to 4x). Unlike other electronic earmuffs, we noticed no distortion of sound through the MP81's speakers. These earmuffs feature a cable with push-to-talk microphone that connects to other Motorola Talkabout radios. It also comes with a second cable that connects to any device that accepts a standard 3.5mm pin, such as a cell phone, including iPhones. Did you notice that we specifically mentioned the iPhone? In our latest conversation with the folks at Motorola, they told us they are working on cable connections for some of the other popular cell phones. Of course, connecting to a radio or phone would be of no benefit without a PTT microphone, which is included with every MHP81, along with the cables for your audio devices. Each ear cup takes two "N" size batteries, which can last up to 335 hours of normal use. The batteries are readily accessible and easily changed. The only suggestion we could come up with for the MPH81 is that we would have preferred the more common AAA batteries, which are inexpensive and available virtually everywhere. With an MSRP of $119.99, the MHP81s are competitively priced with other electronic ear muffs, yet offer the additional benefits of hooking up to your Talkabout radio or iPhone. These are excellent ear muffs; our problem is we only have one set, so we have to flip a coin to determine who gets the Motorolas and who gets the big box specials. Jim almost always loses. One final point: should you ever need to replace the headband or ear seals (which is unlikely), they can be ordered directly from Motorola.